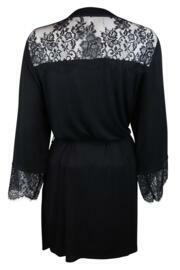 This wrap is pure sophistication mixing soft jersey fabric with delicate eyelash lace. It’s the perfect companion to either the Pyjamas or the chemise for a complete set. We love how glamourous the lace is both on the cuffs and on the back. Goraco polecam zakupy w Pour Moi. Beautiful fabric and lace. Great cover up, so pretty. Love the feel & warmth of it.